Finalists at the Liebherr 2017 World Championships in the German city of Düsseldorf, when Ma Long beat Fan Zhendong in a contest of breathtaking quality, the crowd in the Bao'an Stadium in Shenzhen is set for a real treat. On the evening of Sunday 3rd June the two Chinese starts will meet in the Men’s Singles title deciding contest at the Seamaster 2018 ITTF World Tour Platinum Kaisa China Open. At the semi-final stage of proceedings on the evening of Saturday 2nd June, Fan Zhendong, the top seed, beat Chinese National Team colleague, Lin Gaoyuan in six games (13-11, 11-6, 12-10, 9-11, 8-11, 11-6), prior to Ma Long, the no.5 seed, ending the aspirations of Korea Republic’s Lim Jonghoon (11-9, 11-3, 11-4, 10-12, 11-2). Defeat for Lim Jonghoon at the hands of Ma Long, who was able to react to the 21 year olds every move, but the Korean can look back on a less than two week period that could prove a watershed in his career. At the Liebherr 2018 World Team Championships in Halmstad he was a member of the Korea Republic squad but was very much in the fifth in line, in the role of reserve behind Lee Sangsu, Jeoung Youngsik, Jang Woojin and Kim Donghyun. Now in Hong Kong and Shenzhen, on both occasions having been required to compete in the qualification tournament, Lim Jonghoon has reached the penultimate round and exceeded the performances of his colleagues. If next week, the World Championships were to be re-enacted and it was a semi-final contest against Germany, would Korea Republic head coach, Kim Taeksoo, still select Jeoung Youngsik, Lee Sangsu and Jang Woojin? A comprehensive win for Ma Long, it was a hard fought success for Fan Zhendong against his Men’s Doubles partner. The top seed was just too secure against the dynamic skills of the player who earlier in the day had created history by winning the Mixed Doubles title in harness with Chen Xingtong. Notably it was the fourth occasion when Fan Zhendong and Lin Gaoyuan had met on the international scene but the first time when not in a final. The record is now three-one in favour of Fan Zhendong. 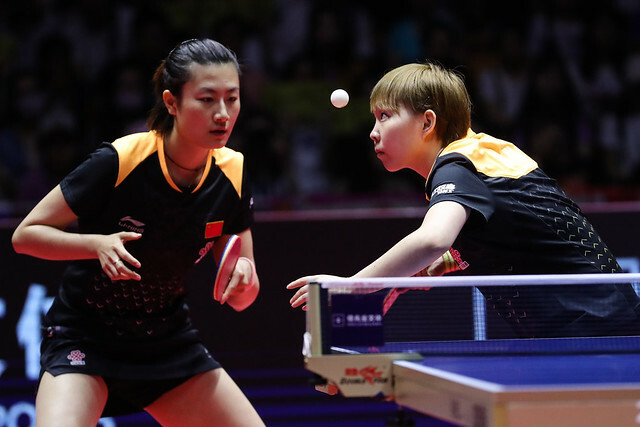 Previously he had prevailed at the 2012 World Junior Championships in Hyderabad and earlier this year at the ITTF Asian Cup in Yokohama; the one win for Lin Gaoyuan was at last year’s Asian Cup in Ahmedabad. Now Fan Zhendong versus Ma Long, too close to call.